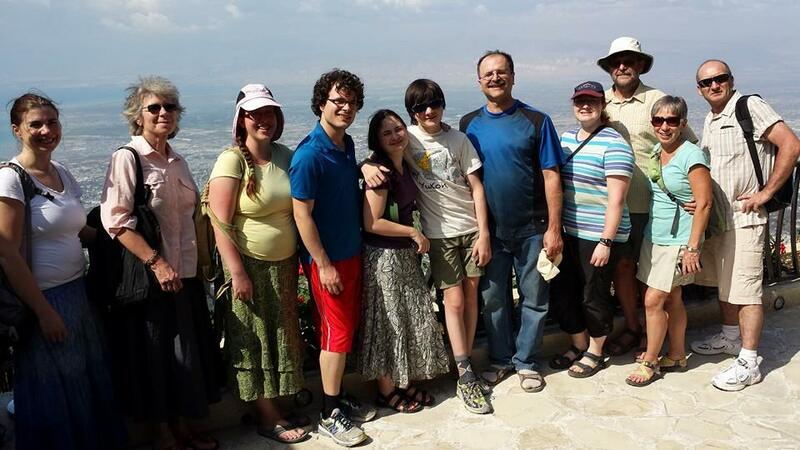 After several years of waiting, praying, and with a growing yearning to be involved in missions, a team of eleven people (six women, five men) from the Whitehorse Church of the Nazarene (including one we adopted from Kelowna) were blessed with the opportunity to serve and be served on a work and witness trip to Haiti in March 2015. Having completed 24 hours of travel from Whitehorse, we were greeting by Darin and Tonya Kucey, our coordinators in Port-au-Prince. Once we navigated a maze of people at the airport, we had the time of our lives riding to the Nazarene property in a "cage truck", seeing the sights and hearing the sounds of Haiti for the first time. 1. Contribute funding for the church to pour a concrete floor for the building they had built themselves. 2. Construct 20 pews, 24 large school desks, blackboards, an outdoor kitchen and a preaching shelter. 3. Participate in the showing of the Jesus Film to over 200 people. 4. Paint the inside of an office building that another team had worked on. The trip was all that we had hoped for and far more. We found the people extremely welcoming and gracious, including a lovely welcome song sung by the school children when we arrived. The community had clearly gone out of their way to make us welcome and comfortable. We found the children especially warm and eager to love these strangers who came into their midst. We returned home having completed our task, but much more importantly, having connected with the people. We returned blessed with a new understanding of missions, a new appreciation for the hardships people endure which, for them, is "normal", with the realization that so much of our own culture is excessive, and with a desire to return and participate in their lives again. It was indeed difficult to leave them and return home. The coordinators in Haiti as well as the support staff at the Guest House were extremely well prepared, hospitable, and ever cautious for our security. We have every reason to be humbly proud of the Nazarene Church in Haiti. We would absolutely love to return at any opportunity we have. In reflection, it is truly amazing what a small group of people were able to accomplish in a short period of time; largely due to all the support that we received from our local congregation as well as the planning and organizing by the Work & Witness coordinators, Darin and Tonya, in Haiti. Many, many thanks to Tanya for doing all the organizing and leading for our team. Having not done this sort of thing before, she did an excellent job. Our team consisted of: Tanya (our leader), Erica, Eli, Fred, Kathy, Lois, Janilyn, Pauline, Paul (from Kelowna), Sarkis, and Pastor Norman. You can read a full report at this link. To view the video, simply click on "Haiti 2015" to the right or you can download a medium resolution WMV file directly below here. To view the full photo collection click here. To view the photo slide show, hover on the picture below and then click "Play" at the top left corner. 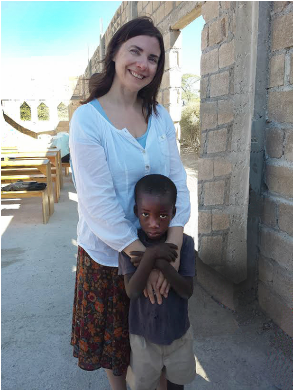 The Docine Church of the Nazarene, located about 4 hours outside of Port au Prince is in a small village not too far from Gonaives, Haiti. If you have google maps, you can download and then open this link to find the exact location of the church (the Google Earth image was taken in 2009 - when the original building still had a roof). The church was meeting in a reasonably comfortable church (it had a roof on it), until the earthquake in 2010; at which point, the roof fell. It seems that the congregation used the roofing materials to build a couple of very small classrooms. They also had started building walls for their new church. The old church (now without a roof) would be their school. Their new church, also without a roof, was build larger and had no concrete floor yet. When our time arrived, they were still pouring some of the new concrete floor. Our "project funds" were used to pay for the concrete. The floor was being put down by the local people. The Work & Witness coordinator estimates that it will cost about $5,000 USD to buy materials for the congregation to build trusses for their new church, or $12,000 to buy the materials for the complete roof. The concrete floor wasn't quite completed by the time we arrived. I'm not sure if that is because they ran out of time before we arrived, or if they ran out of funds. If the Lord puts it on your heart to support the ongoing completion of the building in Docine, please contact Pastor Norman. We got to ride in a "cage truck" - an amazing experience. Pastor Norman gave a message in Haiti Sunday morning. The drive to Docine was about 4.5 hours from "home" (one way). Meeting Absolu (our translator) "Aboso-who? Absolu!" One Haitian Gourde (pronounced without the "r") is worth roughly 2 cents. One US dollar would get you about 47 Haitian gourdes. Couldn't say goodbye to our driver, Colson. "Too hard, too hard". We learned why "God is so Good" (hint: ask Sarkis). Stop signs? Ha ha ha ha ha. They mean NOTHING. Double lines on the road? They mean "don't take your time passing someone going uphill and around a blind corner"
Horns honk all the time - not out of anger - but to signal. Hot. Very hot. (Think, "I'm melting...") And it wasn't even summer. Goats ride on top of the bus (at least, the ones we could see). Found it so easy to love perfect strangers - especially the children. Do not believe Google Map's estimate of how long it takes to go somewhere in Haiti. You can safely double that. Do you have a toilet that flushes? Consider yourself extremely blessed. Very difficult to leave Haiti behind (and not smuggle one or two children back with us).